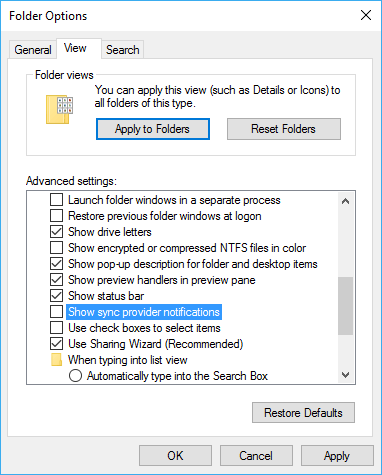 At the top of File Explorer of Windows 10, occasionally there may be sync provider notification displayed prominently, most commonly promoting and asking you to try out related Microsoft products such as Microsoft OneDrive and Office 365. Users are normally given option to press “Not now” or “Later” to ignore the advertising, or another button to take action immediately, such as “Learn more” and “Sign in”. Access and share files from any device with OneDrive. Sign in with your Microsoft account and get started for free. These notifications aren’t connected to any app or to your files, and Microsoft intends to use it to provide “product education” such as new features or information on how to use Windows better. Go to View tab on the ribbon menu. Click or tap on Options. In “Folder Options”, go to View tab. Under “Advanced settings”, uncheck Show sync provider notifications. Click or tap on OK to close the dialog.